It is very rare that a young writer makes her literary debut with a collection of short stories, but Ms. Quade has won me over with her amazing eloquence of the human condition. These stories, most taking place in the Southwest and specifically central and Northern New Mexico, deal with the layered complexities of youth, betrayal, disillusionment, and the frailties of the human heart. Mixed in beautifully are the subtleties of our rich Hispanic culture, so specific to this area. A small town girl's fantasies about Fiesta, the bloody Good Friday ritual of a man confused by his entire existence, the sting of economic disparity between the rich and those who serve them, and the heartbreaking allegiance to family, no matter what the consequences, are a few of the themes running through this thought provoking collection. Her ability to see beyond the surface and dig deeply into both character and action left me wanting more, as if any of these stories could become whole novels. Look forward to seeing what this gifted writer does next. 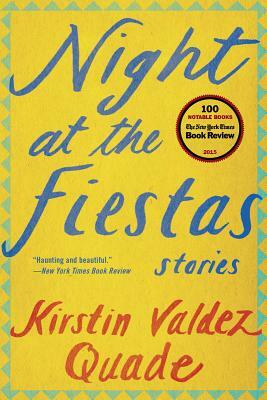 With intensity and emotional precision, Kirstin Valdez Quade's unforgettable stories plunge us into the fierce, troubled hearts of characters defined by the desire to escape the past or else to plumb its depths. The deadbeat father of a pregnant teenager tries to transform his life by playing the role of Jesus in a bloody penitential Passion. A young man discovers that his estranged father and a boa constrictor have been squatting in his grandmother's empty house. A lonely retiree new to Santa Fe becomes obsessed with her housekeeper. One girl attempts to uncover the mystery of her cousin's violent past, while another young woman finds herself at an impasse when she is asked to hear her priest's confession. Always hopeful, these stories chart the passions and obligations of family life, exploring themes of race, class, and coming-of-age, as Quade's characters protect, betray, wound, undermine, bolster, define, and, ultimately, save each other.